Do you have diabetes and continuously have numbness and tingling in your feet? You may be developing signs of peripheral neuropathy. 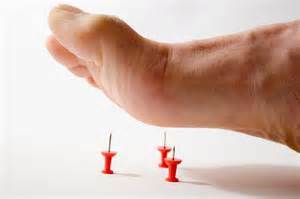 Diabetic neuropathy is a type of nerve damage that happens in people who have diabetes mellitus. “Diabetic neuropathy affects mainly the peripheral nerves. The most common type is peripheral neuropathy which affects the arms and legs. This is experienced by approximately 50% of diabetic patients suffering from neuropathy and is more common in males than in females”. Diabetes is associated with nerve damage (peripheral neuropathy) and poor circulation (peripheral arterial disease – PAD) in the lower limbs, either of which may lead to foot ulcers and infections, and eventually to amputations. Diabetes is the leading cause of non-traumatic lower limb amputation. Nerve damage affects the legs and feet of approximately 13% of Australians with known diabetes and 7% of those with undiagnosed diabetes, while the prevalence of poor circulation in the legs and feet is almost 14% in those with known diabetes and 7% in those with undiagnosed diabetes. With appropriate diabetic screening and routine foot and nail care provided by one of our experienced podiatrists we can reduce the risk of these statistics from becoming your reality. Podiatrists are highly skilled to conduct thorough neurovascular assessments which will test your nerves and blood flow. These tests will detect any deficits that may otherwise be a cause for concern. Having your feet professionally attended to on a regular basis will reduce the risks of cuts and bleeds which could easily turn into serious infection and possible lower limb amputation with diabetic patients. “It is frustrating to have seen so many preventable diabetic ulcers in my time as a podiatrist and patients who are just not caring about their feet because they have “more important things to deal with”. I can tell you that I have seen many amputees in my time who really do struggle just to do the most basic of tasks such as getting dressed in the mornings. If they had their time over again they would have had given their feet a greater priority”. If you have diabetes and want to start making a difference to your feet TODAY! Then here are some simple golden nuggets that could prevent your unnecessary trip to the operating theatre. First and foremost, it is crucial to manage your sugar levels and keep them within an “acceptable” range. By keeping your sugar levels within an ideal range you could minimise further damage to your nerves and prevent further loss of sensation to your feet and hands. Secondly, be careful of what you eat and make sure you do plenty of exercise to keep the blood pumping. Podiatrists are trained to provide regular foot and nail care in a safe and hygienic manner. Conducting regular diabetic screening is important to monitor progression of the sensation in the lower limb and ensure there is no deterioration or issues that need to be addressed immediately. If any of this relates to you or somebody you know and you would like to take immediate action then you should get in contact with us. You can simply phone us today or use our very easy online booking system. So why wait? Get your feet sorted today!